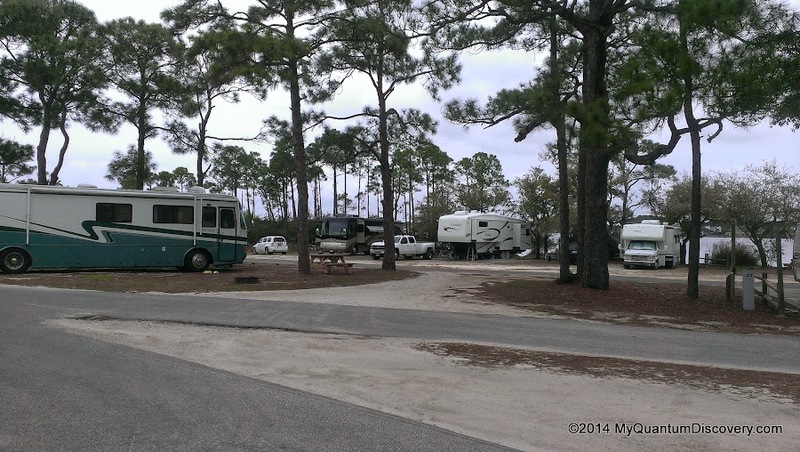 Divided into two campgrounds (Lagoon and Pine Grove) along Grand Lagoon, this state park located on 1200 acres has 9 Tent Only sites and 149 RV/Tent sites (back ins and pull thrus). The majority of the sites are for smaller rigs, but 39 sites can accommodate rigs up to 40′ and 18 of those can handle 45′ rigs. Each site has electricity (all have 30A but only 44 also have 50A), water, a picnic table, a fire ring and a grill. No sewer hookup except for 5 of the 8 camp host sites (which are not reservable). There is a dump station near each of the two campground areas. The Lagoon Campground area (Sites #1-#101) is more open with less vegetation while the Pine Grove Campground area (Sites #102-#175) is heavily wooded with more vegetation between sites and more challenging to maneuver in a big rig. The rate is $28 per night (50% discount for FL senior residents). Reservations can be made through Reserve America. Park seems very popular so if you want to stay here book early. Day use rate is $8 per vehicle. Definitely a lot to do here. 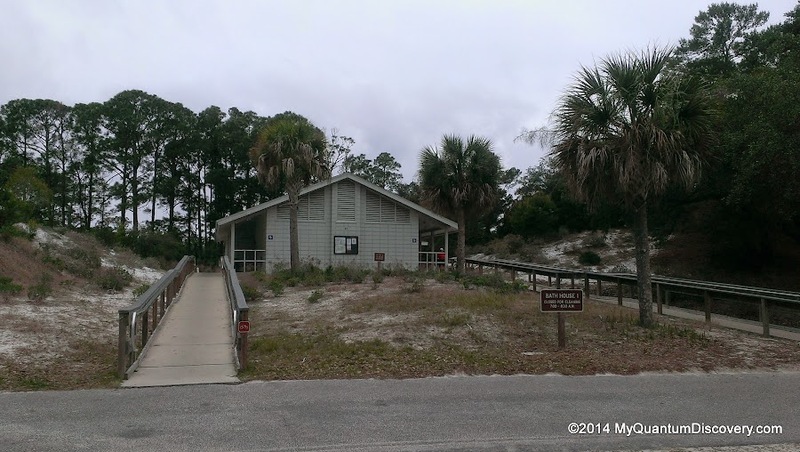 With it’s 1-1/2 mile white sand beaches on the Gulf side within walking/biking distance (~1 mile), a fishing pier and boat ramp in the campground, shuttle boats to nearby Shell Island, several nature trails ideal for walking and wildlife viewing, canoeing/kayaking, scuba diving/snorkeling, surf boarding, picnic pavilions, and playground, there is something for everyone. Three concession stands offer snacks, souvenirs, bait, fishing licenses, limited grocery items, and rental of chairs, umbrellas, snorkeling gear, and kayaks. If you are interested in learning about the animals, birds and plants in the area, there is a very informative interpretive center at the registration office. Ranger led programs are offered several days a week. 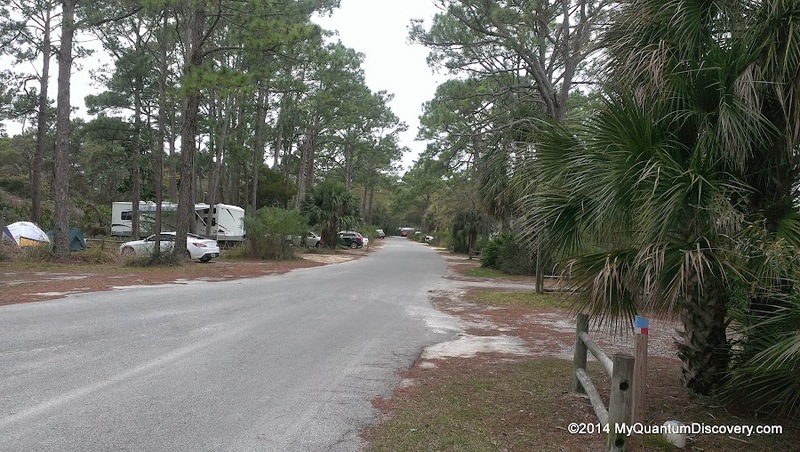 The campground is located close to Panama City Beach and Panama City so it is a short drive to grocery and other retail stores, other services (ie medical, post office, etc.) and numerous restaurants. Near the boat ramp at the entrance to the Lagoon Campground, there is an old Cracker Turpentine Still which is a replica of an operational turpentine still from the turpentine era when turpentine and rosin were indispensable to Naval stores. Signs explain the entire turpentine process. Quite interesting. Although a little narrow and in some cases in need of minor repairs, roads are asphalt and mostly easy to maneuver in a big rig. Sites in the Pine Grove area looked to be notably more challenging to big rigs. Be aware when arriving at the entry gate that a sharp right turn will be required to enter the parking area to go register. 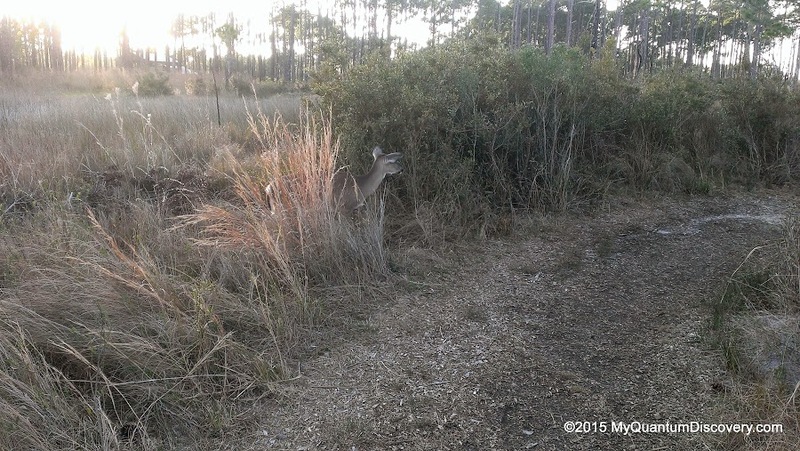 Rigs with a large tail swing should be cautious. Difficult to give one overall assessment of the sites because there is a lot of variability. Sites in both campgrounds appear mostly level. Most have minimal privacy and are typically sandy dirt with some grass. There is no separate tent area and many of the tent sites were very cluttered. 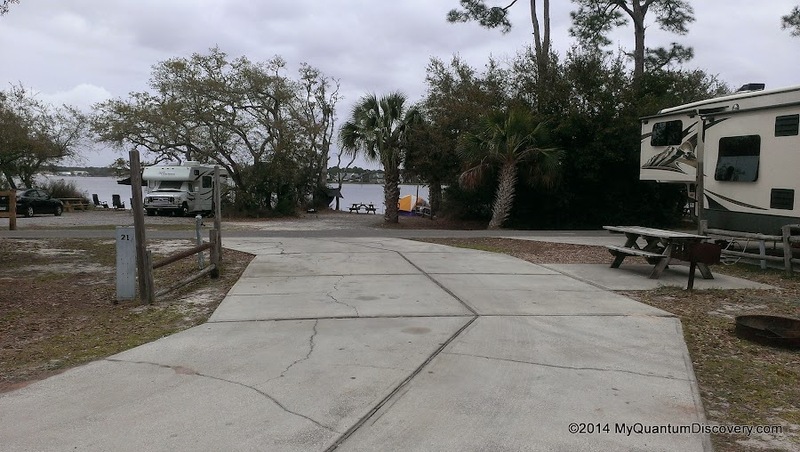 Four of the six pull thrus on the Lagoon Campground are handicap accessible so they have cement pads (sites #17, #19, #21, #25), the other two (#57, #59) are dirt. 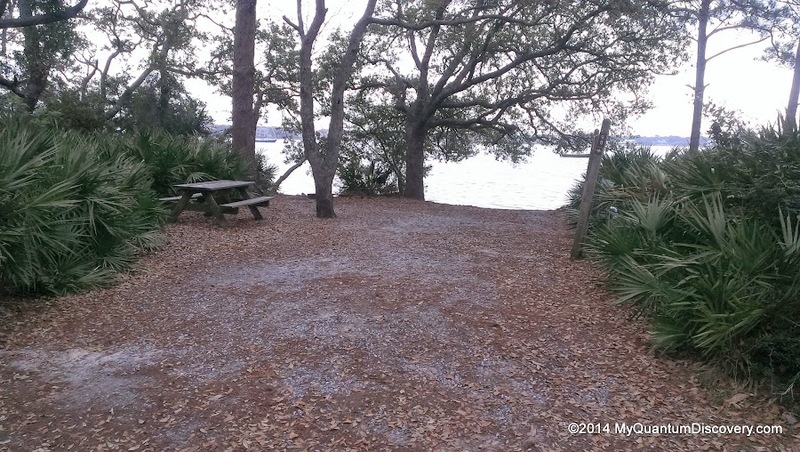 Note there is one other 35′ back in handicap accessible site (#61) with a cement pad. All of the pull thrus are centered between the one way in and out loop roads (expect some traffic noise) so they are not located directly on the water. These sites do have a somewhat limited water view, blocked in part by whatever rig is parked on the waterfront site across the road. Except for a few trees, there is little vegetation on the pull thru sites to provide any type of privacy. Back in and parallel sites are primarily dirt and grass with a number of them directly located on the Grand Lagoon. Some of these sites have more vegetation and offer more privacy with the picnic table and fire ring located next to the water and therefore behind the rig. Sites in the heavily wooded Pine Grove Campground are back in and seem less spacious but perhaps that is because of the more abundant vegetation between sites. All of these sites are dirt. There are two dump stations, one in each campground. One was located directly across from our site (#17), surrounded by a fence. There are two restrooms for each campground area (a total of four for the entire campground). I checked out the restroom across the road from us and it was quite large, very clean and well maintained. 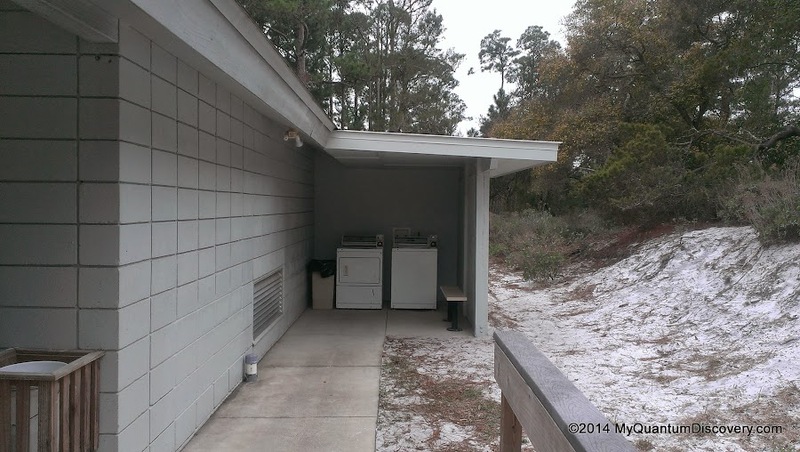 A washer and dryer was located outside in a covered area adjacent to the restrooms. I believe this is the only laundry facility within the park but I am not positive about that. Satellite – Sites located on the Lagoon loop are probably the best bet for satellite reception as the sites in the Pine Grove loop are more heavily wooded. From our site #17, we were able to pick up the all three DISH Network satellites in the Western Arc (110, 119, 129). WiFi – Wifi is not offered at the campground. Cellular signal – Excellent Verizon signal. Over-the-Air (OTA) TV – Excellent, picked up 20+ stations without cranking up or pointing our antenna. Power – Excellent. Stable 120v plus on both legs of the 50A even under load. Note that all sites have 30A/20A but only 44 also have 50A. Water Pressure/Quality – Very Good. Pressure exceeded the 45PSI we have set on our regulator. Good clarity, no strong odors, moderate hardness. View of the Lagoon – View of the Lagoon although somewhat limited from our site #17 was nice. Clearly the waterfront sites will make any experience here more memorable. The view across the lagoon was mostly of condo’s, high rises and other private homes. there was a lot of pleasure boat traffic within the lagoon. Most of the lagoon front sites would make it easy to launch a kayak or other small boat right from the site. 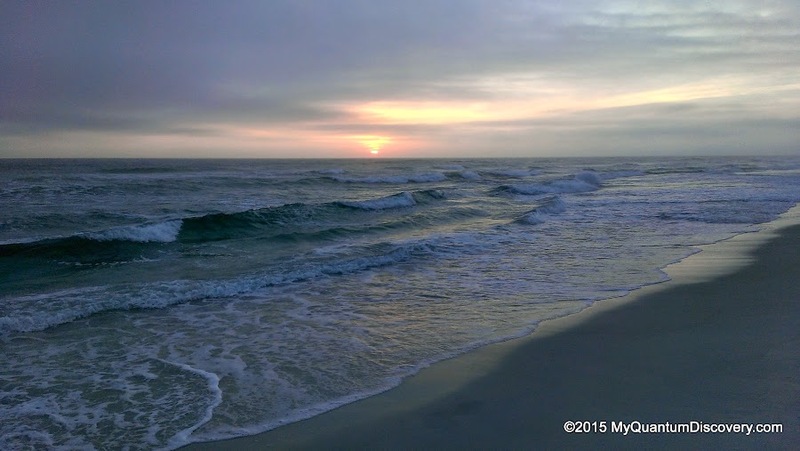 Beach – Lovely, white sand beach on the Gulf of Mexico was a 15 minute walk (~1 mile) from the campground. 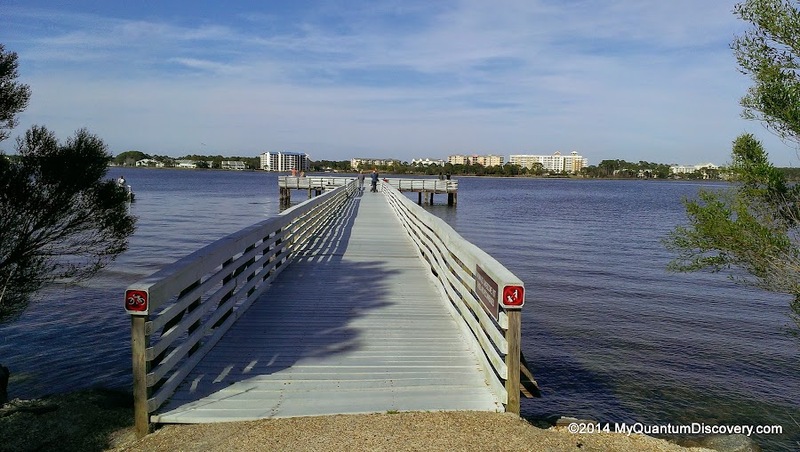 Several boardwalks near the inlet provided beach access. The gazebo looking structure was once a military gun emplacement. A separate fishing pier about a mile west of the inlet was also very scenic. 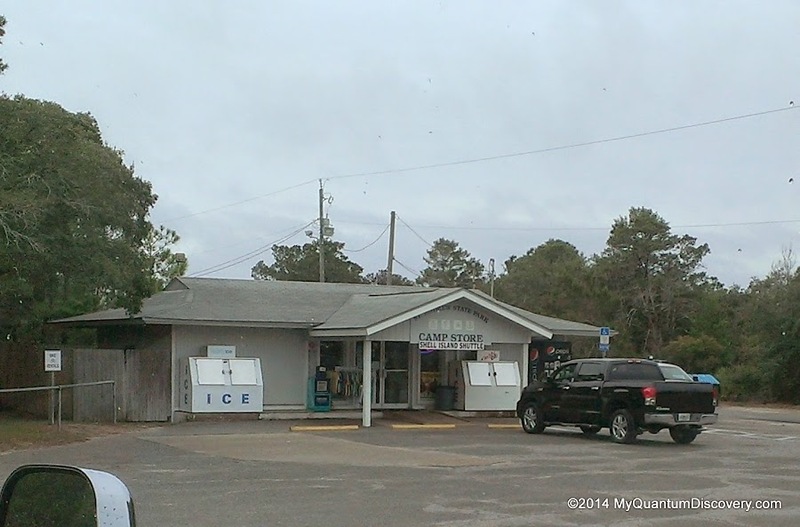 Nearby retail – Close proximity to grocery and other retail stores. There are several breakfast joints and seafood restaurants nearby. Noise – cars, boats planes, etc. Cars and motorcycles passing by our site on both sides. Pleasure boat traffic up and down the lagoon and commercial traffic (tugs, barges, etc.) thru the inlet. Aircraft everywhere particularly military jets and helicopters. On top of that, being next to the dump station we were subjected to the constant rumble of sewer totes being towed back and forth. Not a Pull Thru – Although #17 was deemed a pull thru, due to the configuration of the road and fence surrounding the dump station, there was no way we could have pulled into our site without unhitching our toad. In addition pulling out of the site might be difficult in a large rig due to tree location and was dependent on the proximity of neighboring vehicles, etc. It was easier for us to just back out. 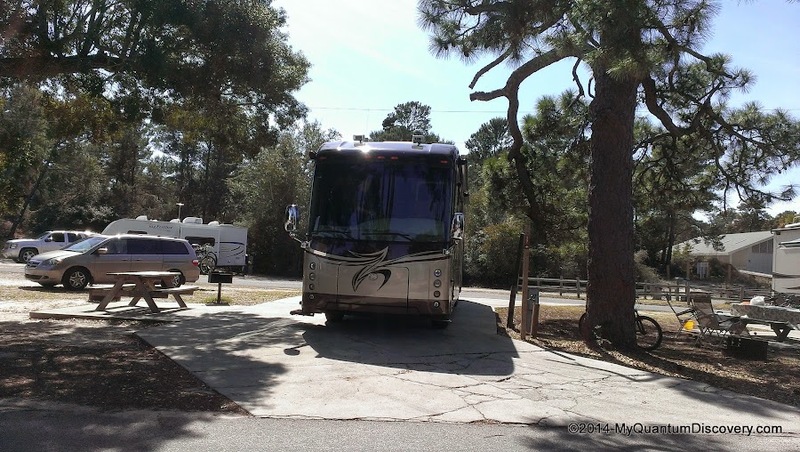 Lack of privacy – Our site #17, a pull thru, bordered on three sides by roads, totally lacked privacy and as mentioned was noisy due to the traffic traveling in and out of the campground. Several other sites appeared to suffer similarly. It was like camping on the median strip on an interstate (although not quite as much traffic). 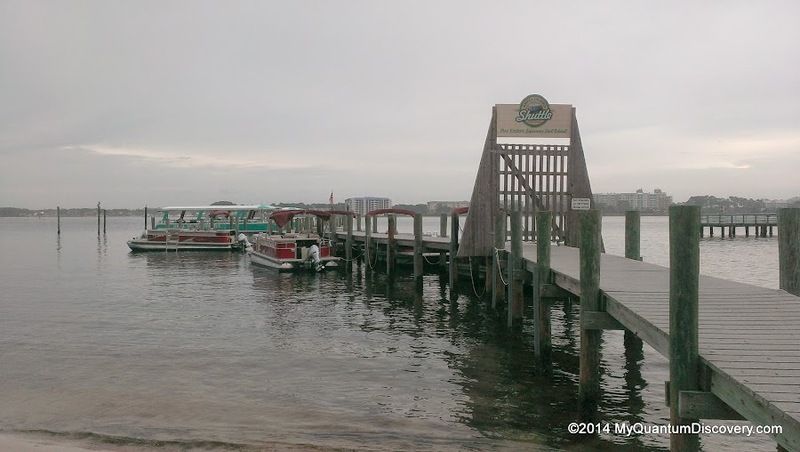 We think our experience here would have been much more memorable if we had a site directly on the lagoon. Speeding cars – No speed limit signs within the campgrounds or speed bumps so people (especially the spring breakers) were driving way too fast both in and out of the campgrounds. There weren’t any sidewalks on the roads within the park especially to Gator Lake and the beach. Although you could walk on the grass on the side of the road, it made us nervous as there was a significant amount of day use traffic. Lovely aroma (NOT) – When the wind blew from the north east, we could smell the lovely putrid odor from a nearby paper mill. Mail deliveries – word of caution, expect a one day delay receiving your mail. USPS delivers mail late in the day (3-4PM) to a parcel locker. 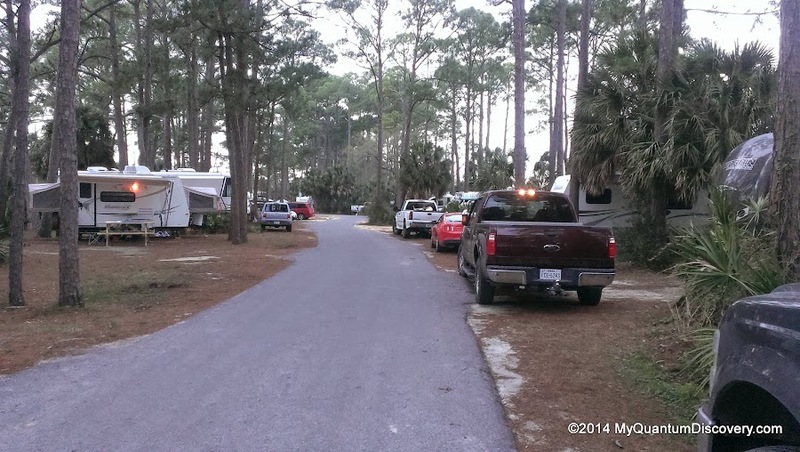 The locker is on the far end of the parking lot and about 300′ from the campground office. The staff here may or may not bother to walk over and empty the locker and sort the mail until the next day (and maybe not even then). One ranger was downright obstinate. Long story, more detailed explanation in a separate post. 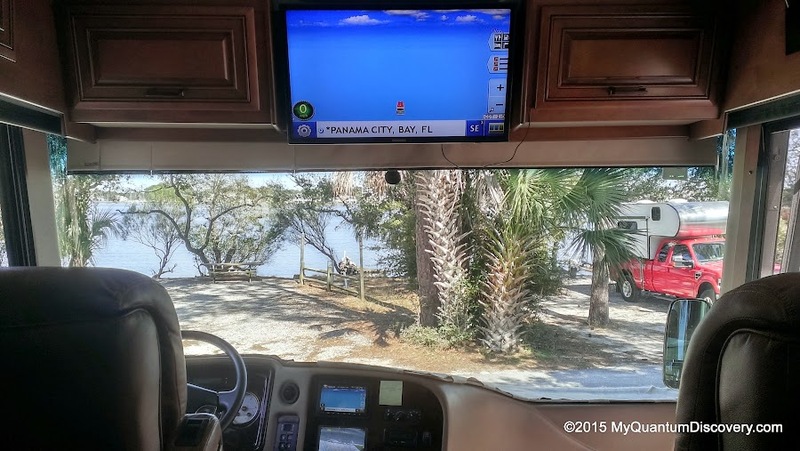 Surrounding area – The surrounding Panama City Beach area definitely is not as upscale as the Santa Rosa Beach area. Older and very run-down looking with a typical beach town assortment of surf shops, several water/amusement parks, miniature golf courses, Ripley’s Believe It Or Not Museum, etc. This is where the spring breakers go in droves, maybe some would like that, we didn’t like the congestion it caused. Spring break “season” here is typically from about mid-Feb to the end of March. We stayed away from the beach when outside of the campground which thankfully was fairly easy to do. Would we stay here again? Yes but only if we could nab a site on the water.